Get the gloss, keep the gloss! McKee's 37 Hydro Blue Coating and Maintenance Kit is the perfect way to add INCREDIBLE amounts of gloss to your vehicle, and save money too! This collection of shine-boosting products has been hand-selected to take the guesswork out choosing products, and to ensure that you get the best results with each use. 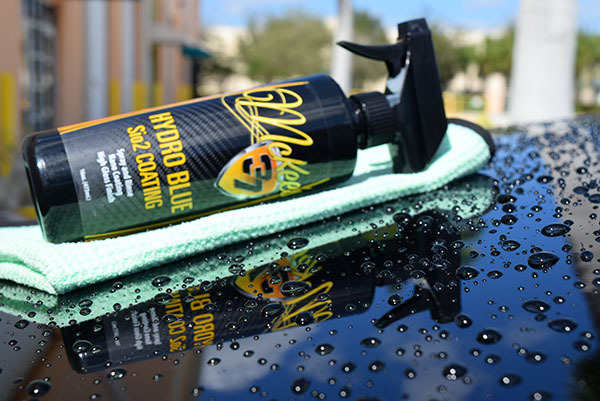 Coat your vehicle with McKee's 37 paint coating to blanket your vehicle in a durable shell of protection, use McKee's 37 Hydro Blue spray sealant to quickly add extreme gloss and hydrophobic properties, then keep it all clean with McKee's 37 N-914 Rinseless Wash. The McKee's 37 Hydro Blue Coating and Maintenance Kit offers a three-pronged approach to gloss that will make heads turn! McKee's 37 Paint Coating is easy to apply and leaves a durable layer of glossy protection on your vehicle. Wipe on McKee's 37 Paint Coating with one of these absorbent, nonabrasive foam pads. The foam is a high quality, closed cell variety that resists drips and smears as it applies products evenly. A total retail value of $83.94. Save $13.95!